Finished Size 37 (39 1⁄4, 43, 45, 49)" bust circumference, buttoned. 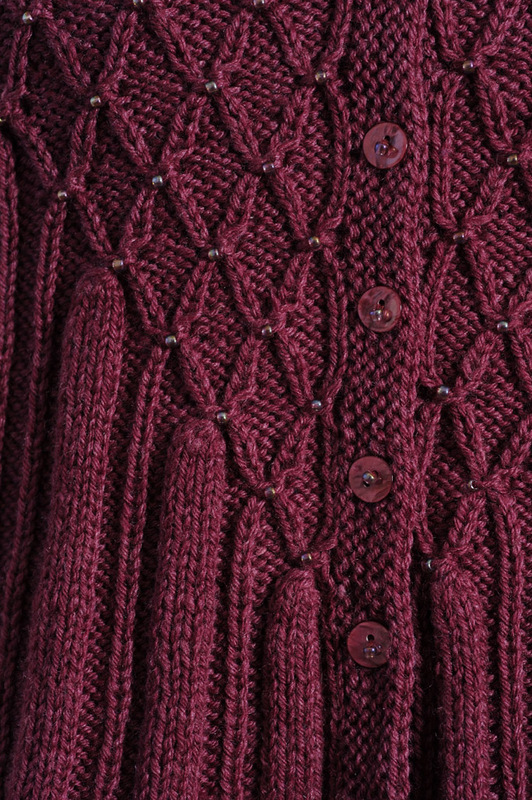 Cardigan shown measures 37", modeled with 2–4" of ease. Yarn Universal Yarn Eden Silk (75% merino wool, 25% silk; 153 yd [140 m]/1 3⁄4 oz [50 g]): #25 dahlia, 8 (9, 10, 11, 13) skeins. Needles Size 4 (3.5 mm). Adjust needle size if necessary to obtain correct gauge. Notions About 230 (250, 275, 310, 340) seed beads size 6˚ or size with holes large enough to fit yarn; 9 (9, 9, 10, 10) 1⁄2" buttons; tapestry needle; dental floss threader or beading needle for stringing beads. Gauge 30 sts and 30 rows = 4" in rib patt with ribbing relaxed; 24 sts and 28 rows = 4" in smock patt. 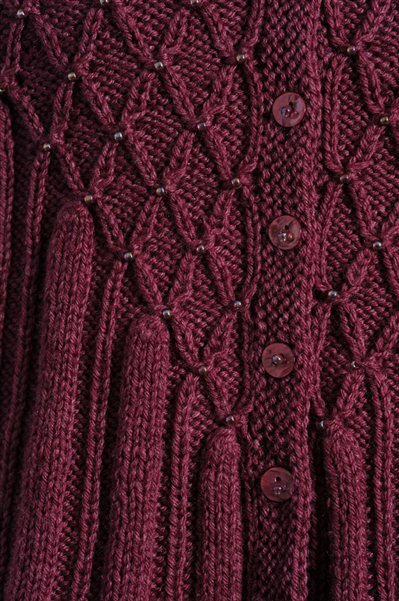 This sparkling cardigan, featuring both beading and smocking, is perfect for a night out. Piece is knit flat and seamed.